Red & black coloured vinyl. Noah Lennox's sixth solo album as Panda Bear is Buoys. The first song to be released from Buoys is “Dolphin”: Lennox’s bright, sincere voice front and center, with miles of space surrounding it, a guitar and some textured samples fleshing out the dubby sparseness and undercurrent of speaker-limit-pushing sub-bass low-end. Buoys was co-produced and co-mixed by collaborator Rusty Santos in Lennox’s adopted home of Lisbon, Portugal. Lennox and Santos last collaborated on the landmark Panda Bear album Person Pitch, which had its 10-year anniversary last year. 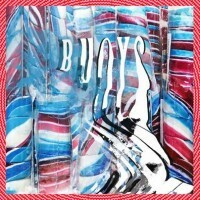 Barry says: Having always been the more electronic side of the musical monolith that is Animal Collective, Panda Bear clearly brings the off-kilter melodies and syncopated Books-esque loop manipulation, with 'Buoys' proving to be every bit the staggered and echo-laden monolith we'd expect. Comfortingly avant-garde without stepping too far into art-rock or ostracising the listener, buoys takes a while to reel you in but when it does, you're stuck for good.